Speaking about better world where everybody is a dancer, we just can't miss to remember the dancing and singing phenomenon Michael Jackson. Leaving apart his complicated personal life, this man has dedicated his creative work to a Better world without pain, hunger and wars and this World was a Singing and Dancing World. Dance is communication system rich enough to build emotional human relations without words. Body motion is not just individual expression of someone's world, but expression of attitude, expectations, feelings such as love, passion, frustration. Today's example of dance communication is a love story, realized on the stage of the dance show "So you think you can dance". Look at the characters and imagine that it could be you in the City Park... how would look your story if you were sitting on that bench? 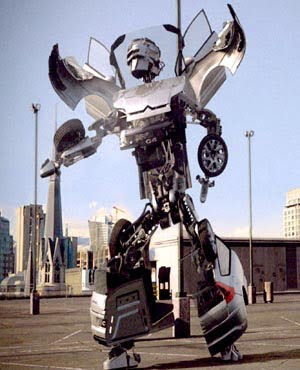 Let's go back in year 2007... do you remember the dancing robot advertisement for Citroen C4? That's one of my favorite examples of excellent combination of design, technology and... dance! This car really is "Alive with technology", Bravo Citroen! Which of them is your personal leader? Pilobolus - another world in motion! Pilobolus represents the idea of A World in Motion par excellence. With its 3 divisions - Pilobolus Dance Theater, Pilobolus Institute and Pilobolus Creative Services - it is a multi-functional organization. It creates worldwide known dance concerts, studying dance programs and movement and dance services for film, advertising, publishing. A great interest for me provokes Pilobolus Creative Services department and its work in advertising communication for clients such as Hyundai, Ford, American Express (look the videos in the "Dance in advertising communication" section in the right column of the blog). These ads are perfect starting point for creation of brand new communicative system in advertising and branding... Hope to participate this process in near future! Excellent example are the "confessions" of 3 incredible dancers - Daniel "Cloud" Campos, Sofia Boutella, Leroy "Hypnosis " Barnes - from the Intro of Madonna's Confessions Tour 2006.
Who says that a real classic can't be redesigned and still preserved? Classical Prelude from Johann Sebastian Bach is living second life in 21-st century with Sting (guitar) and Alessandra Ferri (ballet dancer). What if you start your day dancing, speak with gestures and stop only to fall asleep again... I bet your dreams will be beautiful!